Create your own MP3 library by instantly adding high-quality MP3 encoding (ripping) to your Windows Media Player. 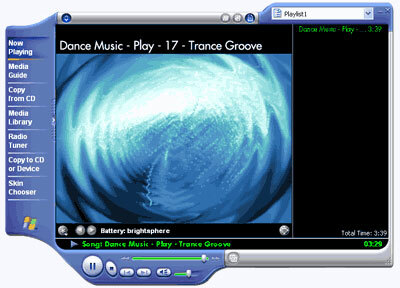 The CinePlayer MP3 Creation Pack is a low-cost way to enable the version of Windows Media Player included with Windows XP to create MP3s from your favorite audio CDs.Its features: Create MP3s quickly and easily, Create an entire MP3 library on your desktop, Edit MP3 information seamlessly. ...... Media Player automatically tracks the change in the Media Library. * Display and edit of MP3 media information (ID3v2 tags) such as album, artist, year of publication and over a dozen others directly in the Windows shell or the Windows Media Player Media Library. * Transfer MP3 files to portable devices. * Burn audio CDs from MP3 files that play in any CD player and data CDs with MP3 for native playback on MP3 compatible CD players. * Add lyrics to any MP3 file. * Display MP3 album art stored in the file in the standard ID3v2 format, or add your own album art to a folder with MP3s. * Choose from four encoding bit rates. Whether quality or file size is your preference, Sonic offers it all at 8kps, 56kps, 160kps, and 320kps. Qweas is providing links to CinePlayer MP3 Player Pack for Windows XP 1.0 as a courtesy, and makes no representations regarding CinePlayer MP3 Player Pack for Windows XP or any other applications or any information related thereto. Any questions, complaints or claims regarding this application CinePlayer MP3 Player Pack for Windows XP 1.0 must be directed to the appropriate software vendor. You may click the publisher link of CinePlayer MP3 Player Pack for Windows XP on the top of this page to get more details about the vendor.